By Melissa Lennig on October 8, 2012 16 Comments. This content contains affiliate links. As an Amazon Associate I earn from qualifying purchases. 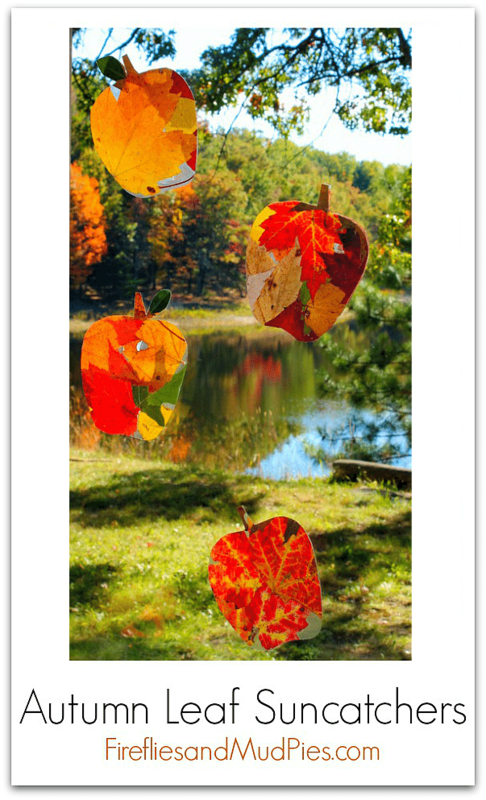 Welcome the fall apple harvest with this simple, beautiful Autumn Leaf Suncatcher craft. 1. 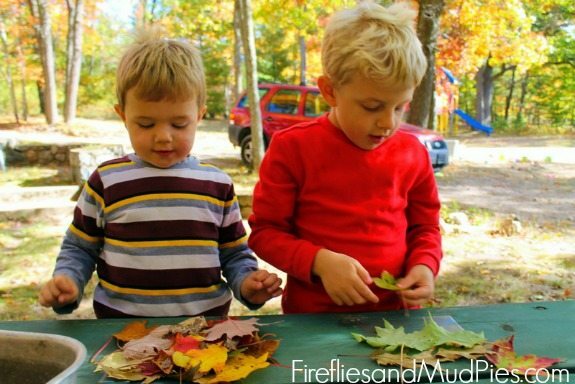 Collect colorful falling leaves from outside. Show your child how to catch them in their bucket as they float through the air. 2. Cut two symmetrical squares of contact paper. Peel the backing off one of the squares and lay it flat on the table, sticky side up. 3. Place the leaves on the sticky contact paper. We placed brown leaves on the top of the contact paper (to create stems) and put the bright leaves underneath. We used fresh wintergreen leaves for the leaves of our apples. 4. Cut the contact paper into the shape of an apple. Colin and Owen had a difficult time cutting through the leaves, so I did this part for them. Reinforce any part that is not sticking with double-sided tape. 5. 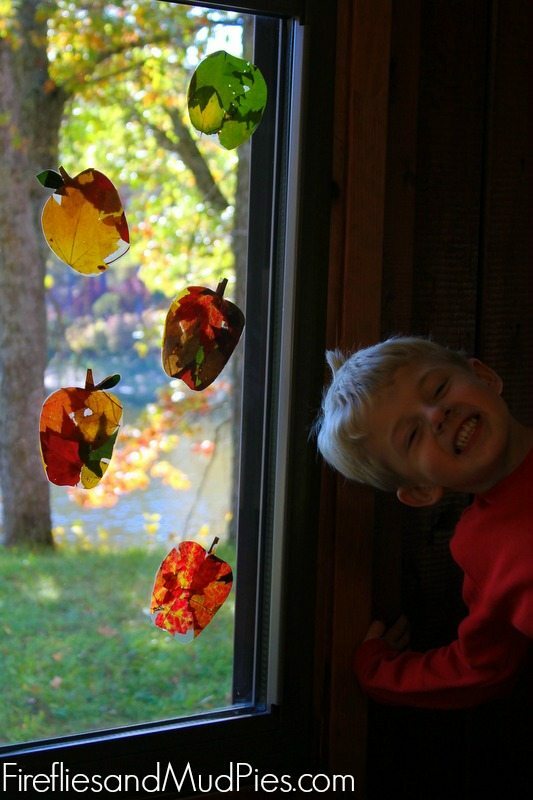 Tape the apples onto the windows of your home and enjoy the sun streaming in through the leaves. The bright colors lasted for several weeks before the leaves dried out. 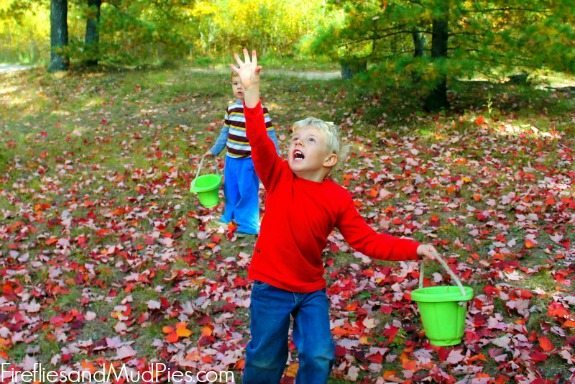 It felt good to get outside in the crisp air to collect leaves with the boys and I will always remember the expressions on their faces as the leaves fell from the trees into their buckets.